During a tennis lesson the other day, I noticed that I was playing and hitting shots and I had all of these rules as to how I should hit a forehand in my head. These rules limited and constricted what kind of shot I could hit. Don't get me wrong, there are hundreds of ways to hit bad forehands and only a few techniques to hit great forehands. Therefore rules often come in handy. But they can limit your progress as well. This is natural for a tennis instructor since we have to show students good mechanics so that they can learn. But I know that teaching mechanics sometimes gets in the way of real learning and the best results. Therefore I decided to use my Imagination Technique. I simply focused on my desired or goal result. I had to be very specific in my visualization. I focused on how much spin I wanted, how fast I wanted the ball to go, how high over the net. Then I simply let my Inner Mechanics (I explain Inner Mechanics below) take over. The conscious mind gives the order and your subconscious shows you how to do it. 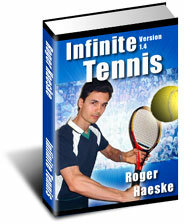 Inner Mechanics is the term I created for the subconscious control of tennis stroke mechanics. It simply means that when you focus on an end result goal in tennis, sports or life, your subconscious gives you feelings and or ideas that provide complete instructions to hit that shot. Why is this important? Because it means you don't have to think about how to hit a shot. Your Inner Mechanics give you the complete directions. But most people try to learn with their conscious minds but their conscious minds don't have the foggiest idea how to hit a tennis ball. Just try thinking about mechanics while you hit a shot and you'll see how difficult it is to hit that shot. There must be another means to properly learn mechanics. Those techniques are what I teach my students and listening to your Inner Mechanics is one of those techniques. Once I started focusing on the goal, instead of how to hit the shot (or the mechanics), my Inner Mechanics kicked in and my forehand quickly had the new attributes which I had visualized. It took about three shots and I was ripping topspin forehands again. My topspin forehand dramatically increased in spin and velocity. It was very different than it was before. I found myself automatically jumping into the shot. I didn't say to myself to jump into the shot. But my Inner Mechanics knew what to do and communicated to me the feeling I needed to hit the shot successfully. This technique doesn't work as well for some people when they are learning a brand new shot. But once you learn the basic idea behind a shot, understand the basic mechanics and are able to hit it with some success then you can start using this technique all the time. In fact, my mechanics changed quite a bit by using this technique and I never consciously focused on the new movements I had to do to make the changes in my shot. My wrist position dropped and changed to a new angle. I started jumping into the shot as mentioned above. And I'm sure many other mechanics changed as well, but I'm not consciously aware of all the changes. If a traditional tennis instructor were to teach someone my mechanics on that shot, they'd simply figure out what I was doing from a mechanical basis. Then they would demonstrate the mechanics and have the student try to copy those exact mechanics. They might also break it down into parts and hope eventually that the student would tie together all of these ideas and learn the shot. This however is a very difficult way to learn and one of the reasons students get so frustrated during tennis lessons. I know because I've had this happen to me many times. Students end up getting too many ideas in their head and they become paralyzed and extremely frustrated. I can't tell you how many times a student would ask me how I did a certain part of my swing and was completely unaware of how I did it. Only after I analyzed it did I know how I hit it. But I didn't need to know how to hit it to be able to hit the shot. It's not the knowledge of hitting that allows you to hit. Our bodies are very complex pieces of machinery, so complex that our conscious minds will never fully understand its workings. You don't have to know every detail of mechanics and in fact, you can't. But you do have to allow your subconscious to feed you the Inner Mechanics because it knows or will quickly learn what it needs to know if you trust it. Your Inner Mechanics are not always correct, but your subconscious learns very quickly. How many times have you hit a shot and your conscious mind was saying you wanted to hit a really hard shot, but your subconscious (or Inner Mechanics) warned you, through the feeling of fear, that you couldn't make that shot under the current circumstances? Then you almost certainly hit that shot either in the net or out. Remember to always set higher goals for yourself and just visualize yourself doing it. Don't set artificial limits on your ability. Sometimes you will need the help of a tennis lesson to get you out of false limitations that you have placed on yourself. So as a gift to you, I'm giving all non-current tennis students a one-hour, outdoor tennis lesson, at half price on your first lesson. The sale price is $22.50 and please take advantage of it while the weather is good. We still have two months of good outdoor tennis weather so you can take advantage of the lower outdoor lesson prices. Contact me directly for specials on indoor tennis lessons in the Central New Jersey Area.